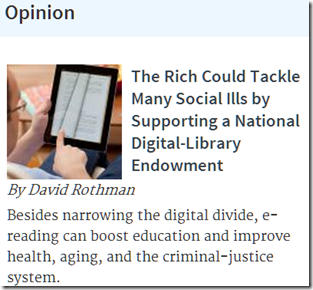 A $15-$20-billion digital library endowment would fund two national digital library systems, one public, one academic. It would also help in more ways—for example, the hiring and Internet-era professional development of school librarians in low-income communities, especially minorities. The endowment likewise could finance first-rate children’s books by and about African-Americans, Latinos and other minorities—this is now a diversity disaster area. Funded by interested members of the super rich, the endowment would complement existing initiatives, such as in early childhood education. 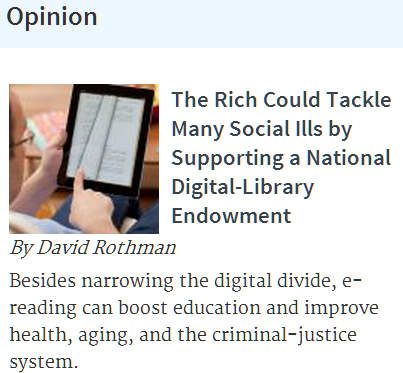 Go here for LibraryCity’s full proposal, published in briefer form in Education Week, The Chronicle of Philanthropy (Web version shown in image), Library Journal and The Baltimore Sun, and on The Atlantic’s Web site. Why we need an endowment: Our public libraries can spend only about $4 per capita on library books and other content. The average 15-to-19-year old in the U.S. devotes only about six minutes daily to reading unrequired texts, according to the Bureau of Labor Statistics. A major study for the International Association for the Evaluation of Educational Achievement showed that the easy availability of books “is a key factor in reading literacy.” Books were even found to be more crucial than smaller classes. Teaching children to read is not enough. We need to keep them reading though both school and public libraries. More on benefits: Reading is the gateway to many other forms of knowledge, and in line with earlier research, a U.K. study shows the recreational variety can be especially valuable. Through the endowment, America would come out billions ahead in areas ranging from crime-reduction to greater workforce productivity and lower health-care costs. Nineteen percent of offenders in a Changing Lives Through Literature program were reconvicted vs. 45 percent in the control group, and the endowment would expand such efforts. Empathy-building books could even improve post-Ferguson race relations. Why turn to the super rich: The old Carnegian formula—give money for buildings and let the community pay ongoing costs—no longer works when cities and counties are so cash-strapped. Existing library endowments total no more than several billion, a fraction of libraries’ operating expenses. And Congress is unlikely to increase national funding for libraries to the level needed. The endowment would not replace existing library funding but rather augment it in a sustainable way. Why a digital endowment: Digital technology could vastly expand the range of content available and would be more cost-effective than paper alone. 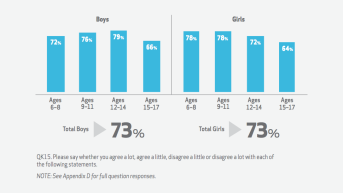 A Scholastic study says 73 percent of surveyed children replied that they would read more if they found books they enjoyed. 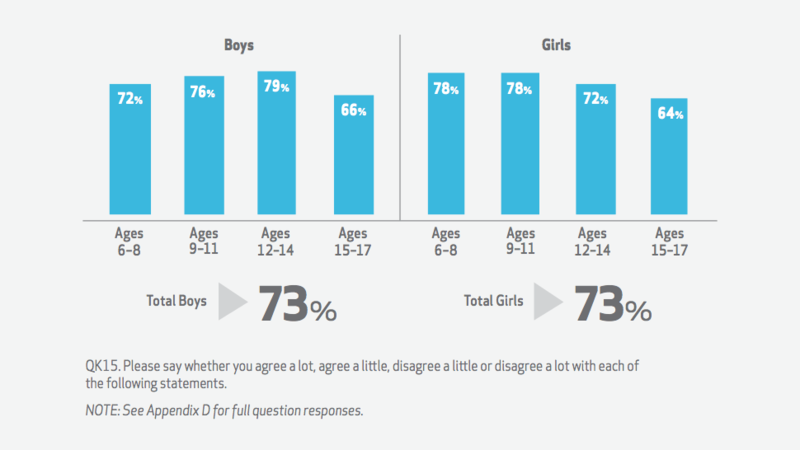 And demand for digital library books is growing. OverDrive, the largest supplier of e-books for U.S. public libraries and schools, says that “circulation of eBooks, audiobooks and other digital media increased 33% in 2014 to 137 million checkouts.” This is not to say the endowment could not also pay for paper books, especially picture books for toddlers and graphic novels popular among teens. But the real future is digital, and Americans are sadly lacking in e-book literacy–knowing how to make the best use of the technology. The endowment would help correct this. It could even help pay for related academic research, which, on e-books, is often subpar (as documented in the proposal). Endowment size: The goal would be $15-$20 billion in five years, with more to come later on. The endowment idea would jibe well with the Gates Giving Pledge, which globally has inspired more than $500 billion in commitments. Only 400 U.S. billionaires are together worth more than two trillion. Just a few of the wealthiest Americans could make a huge difference. Public funding would also be an option in the future, especially as the endowment justified itself. Organizational details: The endowment would honor rich donors in ceremonies and as advisors and would name collections after them. But professionals would run the organization. It could start as an NGO and, for maximum transparency and responsiveness, evolve into a public agency. The public and academic digital systems funded by the endowment would share infrastructure and billions of gigabytes in content; and boards would overlap somewhat. But we badly need a dual-system architecture to assure enough attention to the digital and reading divides as well as accessibilty issues.